American Flag Denim Bling Cap - Hat | BUDK.com - Knives & Swords At The Lowest Prices! There’s no better way to show your true patriotism than in sparkly, flashy bling! 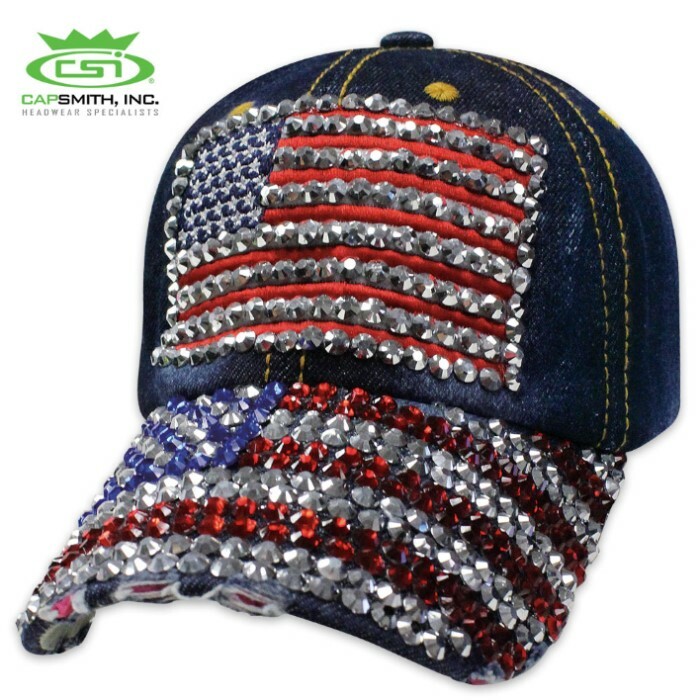 Our American Flag Denim Bling Cap makes a big statement! The six-panel cap is made of quality cotton denim with yellow accent stitching. On the front of the cap, an embroidered American flag patch, accented with silver rhinestones, catches the eye and draws it down to the American flag design on the distressed bill. The design is created using red, white and blue rhinestones that catch and reflect the light with their multi-facets. The hat can be adjusted to fit with a band and metal buckle closure. With our ultimate bling cap, your American pride will ring loud and clear!